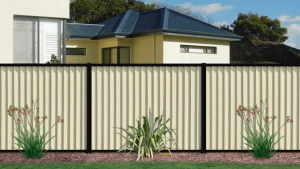 Ever wonder what your back yard would look like with a Colorbond Lysaght fence? Lysaght recently introduced a useful new tool that enables property owners to experiment with different colours and styles of Colorbond fence right from their computer. The new tool is incredibly convenient, as it provides a virtual preview of your potential fencing to see what would look best before investing money in a professional installation. With the new Lysaght fence visualiser preview tool, users have the option of filtering by product, fencing type, colour and more, even choosing different plants and background settings to best visualise the fence on your home or business property. Once you’ve decided on the design, just save it as a PDF and present it to your Team Work Fencing contractor. That’s right, our experienced fencing specialists do fast and professional installations of original Lysaght fencing products and Lysaght Colorbond fences, and we service Perth, Bunbury and most of the neighbouring areas in Western Australia. Simply show us your design and we will provide you with a free, no-obligation quotation. Whichever Lysaght product you choose, you can rest assured that you’ll be getting quality fencing that will perform and look amazing for years to come. There are 14 colours of Colorbond steel to choose from, so complementing your existing décor is easy. 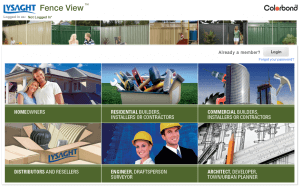 If you have any questions about Lysaght Fence View or would like to learn more about Lysaght fences and Colorbond fencing products, Contact TWF Here. We look forward to chatting with you!